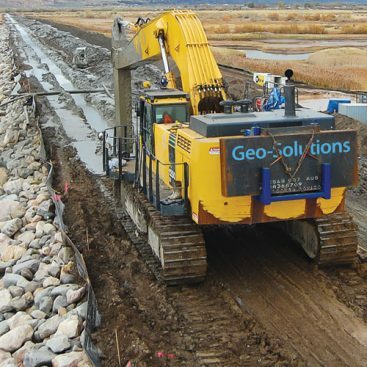 Christina River Dike Breach Repair – Geo-Solutions repaired, narrowed, and stabilized four severely eroded breaches within the dike separating the wetlands and the bordering Christina River. The breaches were narrowed and shaped by hydraulic excavator. 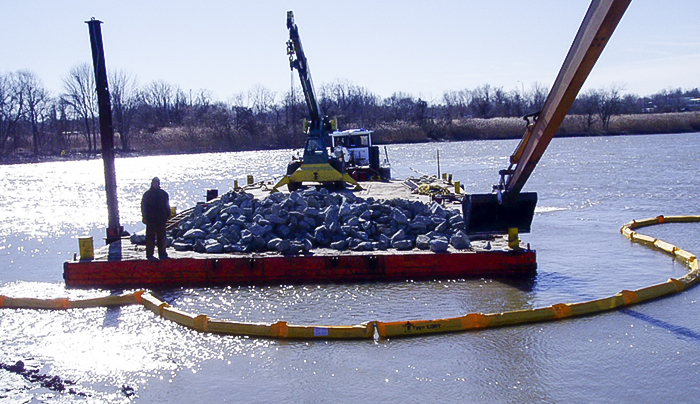 A layer of geotextile was placed and riprap was used to restore the original contours of the dike. Black Willow Live stakes were then planted to provide eventual vegetation. “Stop-Log” Water Control Structures – A total of five “stop-log” water control structures were place within the dike separating the marsh from the Christina River. Each stop-log, consisting of a precast U-shaped concrete structure with internal brackets designed to accommodate timbers, which can be added and removed to adjust and control tidal flow into the existing channels feeding the marsh, was placed using a combination of hydraulic excavator, barge, and hydraulic crane. Locations were excavated to a design grade, geotextile and a crushed stone base were placed followed by the stop-log structure itself. Stop-logs structures were blended into original dike topography and riprap was placed along all disturbed areas for stability. Coordination of work with natural tides was key for the effective placement of each structure. Tidal Pool Creation – Two interconnected tidal pools were created within the marsh. The two large pools, comprised of approximately 18,000 yards of excavation and resulting in over 6’ of pool depth were connected by a deep channel which was tied into the water control structures and existing channels feeding the marsh. The pools were designed to provide open water features and fish habitat, especially during periods of low tide. Both pools and channel were excavated using hydraulic excavators; large volume pumps were used to control water during excavation. All spoils were reused to create upland features within the marsh. 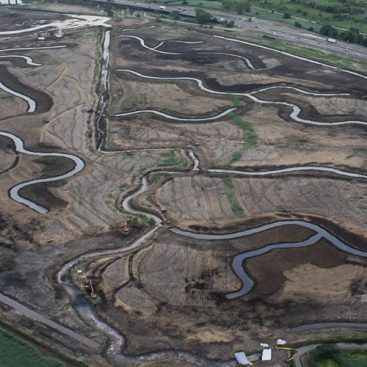 Marsh Excavation – Approximately 75,000 cubic yards of sediment and dredge spoil were excavated to design grades throughout target areas of the 202-acre marsh. 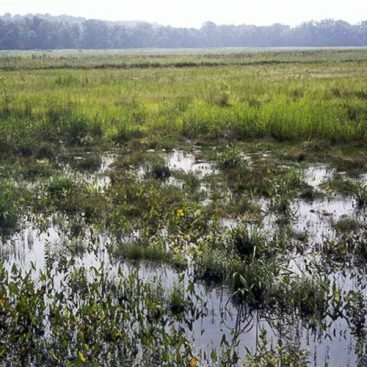 High and low marsh areas were created to restore effective tidal influence throughout the marsh. Spoils were placed in designated areas to provide upland island habitat throughout the marsh. Channel excavation to feed the newly created/restored marsh and open water features. Disposal area creation to contain the spoils placed for upland island creation. Seeding and mulching of upland areas with custom blended upland seed mix. Marsh cleaning and debris removal. Geo-Solutions worked closely with designers Milone & McBroom and the Delaware Department of Natural Resources and Environmental Conservation (DNREC) to assure all activities met the intent and requirements of the design, and were done with as little impact as possible to existing marsh and the birds, fish and wildlife that inhabited them.